Drawing from data compiled over the past century, Vinod Bakthavachalam of Making Every Vote Count and Professor Samuel Wang of Princeton University have traced the history of that singular, strange irony that occurs only in American politics: the way we elect our president’s irksome potential to decide an election in favor of a candidate who wins the most electors but loses the national popular vote. Since the popular vote was first tallied in 1824, the winner of the national popular vote has lost in the general election an astonishing five times—and in our era this trend is only increasing. 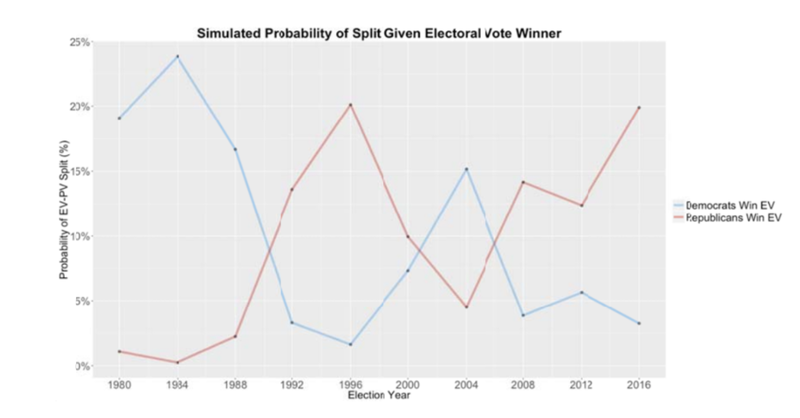 On average, the scholars’ predictive model says we can expect to see a split between the electoral and popular votes one out of every three elections for the foreseeable future, so long as presidential elections remain competitive. Historically, there is a positive correlation between the vote being close and the likelihood of a national popular vote-electoral vote split. This generally means that whenever the difference between each candidate’s share of the popular vote was small, there was a higher likelihood that one candidate would earn more votes overall (i.e. the national popular vote) and yet still lose the presidency because he or she failed to win the most elector votes. Despite this outcome being most likely in the most competitive election years, analysis has found that there is still a 1 in 7 chance that the winner of the popular vote will lose the election despite trouncing the opposing candidate by a margin of ten (10) percentage-points. Divisive demographic changes, which the United States finds itself in the throes of yet again, have tended to make our American presidential races closer by polarizing the electorate along racial and socioeconomic divides, particularly in times of great technological change. Demography and historical precedent dictate that 2016’s dramatic split between Clinton’s 2.9 million popular vote lead and Trump’s decisive Electoral College victory was no accident; such splits are likely to recur. If our elections remain close, and our electorate predictably polarized, we will continue to see split elections which create cognitive dissonance for most Americans, even for those who understand the reasons behind it. “If we continue to see close Presidential races,” says Mr. Bakthavachalam, “Over 30% of elections in the next century are likely to select a President against the will of the majority of voters.” This projection should cause pangs in the conscience of any democratically-minded person. As this blog has argued, our current electoral rules suffer from serious defects that must be remedied. For instance, because of the winner-take-all model of allocating electors, it is mathematically possible to win the presidency by earning only 27% of the popular vote. Our system has never been truly representative, but it has become objectively unrepresentative of the American body politic. Restoring our electoral system’s integrity means that every vote should count, and be weighed equally, which could not be further from the present scenario. Transitioning to a more equitable presidential selection process, in which all votes mattered and would hold equal weight, is all the more imperative because we find ourselves in the deadlock of polarization and sparse bipartisan dialogue. Making a few key changes to how we elect our president could disrupt an unfortunate historic pattern that we will otherwise be doomed to repeat. The silver lining is that we can break the cycle by reforming our elections. By making our president consistently representative of the majority vote, we can level the political playing field and make every vote equal. States can pass a law that pledges their electoral votes to the winner of the popular vote. If we change the rules so that the person who wins the most votes always becomes the president, candidates for the first time would have to appeal to voters nationwide instead of in the handful of close states alone. Random outcomes in one to three states with the smallest margins of victory would no longer determine the winner. Voters in all 50 states would. The winning candidate would unify the country by appealing to voters everywhere. We have a broken system, but we can fix it! Older PostHow Can We Make Politicians Serve Country Over Party?